I have the slight feeling the dev team keeps over-complicating the Blueprints... let me share my thoughts on this. Blueprints are ideas, and ideas can be copied endlessly and they are difficult to erase. This would be my guiding principle when designing anything around them. 0. Blueprints are ideas, not a capability. So Blueprints should not be dependent on the tech tree progression. 1. Blueprints are held in the BluePrints Library (BPL) always, unless they are explicitly deleted there. BPL is the main depository of Blueprints. Availability of BPL should not be a function of tech tree (e.g., requiring robots). If a Blueprint is deleted in the BPL, it is deleted in the inventory, toolbar, chests, too (maybe after a prompt?). Blueprints deleted elsewhere (not in the BPL) are only deleting the local copy. Having a unique identifier per Blueprint is a nice touch, although this will have to be managed across the whole player base to avoid "multiplayer Blueprint mayhem" when sharing. 2. Whenever a Blueprint is picked up from from wherever it was (the BPL, toolbar, inventory, chest), it is in fact a copy of the Blueprint itself. The original stays where it was, unless it is deleted. The picked up copy can be used to "print" on the ground, place the item into another location (BPL, inventory, toolbar, chest). If it was not picked up from there, this will create a copy, otherwise this creates a duplicate. 3. Whenever a Blueprint is picked up and I hit Q, the 'copy' disappears, and it does not end up as a new copy in the inventory, BPL, toolbar, chest. 4. We can organize the Blueprints into Books (a.k.a. folders), where you can freeze the layout, or sort alphabetically, sort on timestamp of creation, sort on required item "maturity", where sorting is based on the tech tree (a higher tech tree item containing Blueprint is later), so blueprints with yellow, red or blue belt are sorted automatically. 5. We can copy multiple blueprints to the BPL, inventory or chest, but not to the toolbar. 6. We should be able to select and copy/delete multiple blueprints in the BPL, chest, not sure if this is possible in the inventory. We cannot select/copy/delete multiple items in/to/from the toolbar. 7. 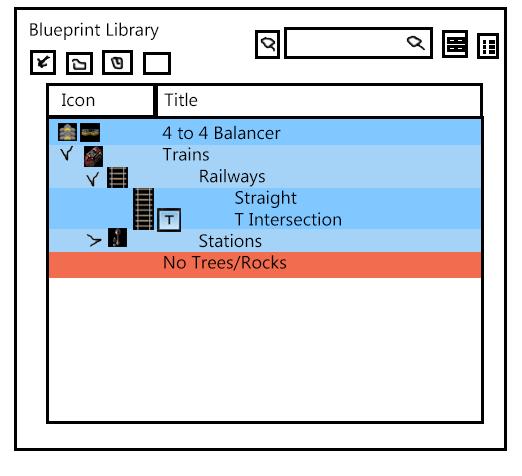 Deleting blueprint is with special action, i.e., right click or long left click and prompt, but should be possible on multiple blueprints selected simultaneously (except toolbar). As mentioned in point #1, deleting Blueprint in the BPL deletes it everywhere, deleting a local copy of a Blueprint in the inventory, toolbar or chest only deletes it there. 8. Exporting/Importing options should be for Blueprints, Books or the whole BPL. 9. BPL can be imported from previous version of game, e.g., upgrading from 0.15.x to 0.16x, similarly as we do with maps now. Error checking, compatibility, etc. should be handled similarly as now with maps. Ultimately, I would love to have my BPL to be everpresent across games (always amend/combine between multiple games), in the same game version main thread, i.e., across 0.15.x, across 0.16.x, etc., unless said otherwise in the options (opt out). Nice touch if you can recover older versions of the BPL, but this could be cumbersome. That's it, let me know what you think. In the text below, Blueprinting Tool = Blueprint, Blueprint book or deconstruction planner. Library = Blueprint Library. Book = Blueprint Book. The blueprint library: [/color]Two main views would be supported for the library. The default view, lending to simplicity for the first encounter with beginning to manage blueprints would be as follows: One window with one grid of large (or small?) spaces. The grid expands infinitely on a row-by-row basis (if any item is placed in any slot of the last row, a new row is added). This grid acts almost identically as a chest. Items can be manually moved there, or fast transferred using any of the shortcuts that work for normal inventories (see comment below). This inventory grid can only hold blueprints, books or deconstruction planners. An invisible property of each Tool or Book item in an installation's Library would hold the position for this grid view. Any spaces without an item associated with it would be blank to allow for spatial grouping. This property will also allow for a "manual" sort in the advanced view below, skipping the empty grids. An ingame save/restore/full clear feature for the current library state will also be available (perhaps only from the advanced screen?) so that collections of prints can be written out, for instance as a backup or for a particular mod pack. The advanced view accessible by a toggle button would act similarly to changing from "Icon/Item" view in Windows explorer to "Details" view. In this view the blueprints would be presented in a more text visible manner and allow for the Books to act as sub folders. The first column (which could reduce to zero if no books are present) would simply provide spacing and the starting point for the Book description. A description line would consist of space for the 4 item icons selected to represent the Item/Book in the normal BP creation process, followed by the title. With a Book item having a caret to expand/collapse it's contents below. A background shading would indicate the item type with a light blue for Books, a mid blue for BPs and a red for Decons. Items can simply be dragged to new positions to alter the "manual" order up and down the list here. However the real power of this view would be in the power of sorting by the Icon columns (as each item already has an order from the crafting panel). An entire system could easily be branched from just this order by default. Also you can sort by the text title. This option would allow for a multiplayer server to request that different types of prints start with different number groupings for an integrated list, see below for MP descriptions. The TRUE MAGIC of the Blueprint Library would be the SEARCH function. A simple search box would search the BP titles, items used in a BP, and the TAGS assigned in a new field in the BP creation dialog. It would simply drop non-matching items from the list in real-time collapsing down the view until nothing matches. There would also be a small button to allow searching for the icons with the same collapsing behaviour of the items displayed in the lists. This should function in the simple and advanced view dialogs. Special behavior: when picking up a Blueprinting Tool from the blueprint library, it is replaced with a "hand". This means that when pressing Q to drop it, it is not returned to the player inventory, instead, back to that slot in the blueprint library. This is so blueprints can easily be used directly from the library. The functionality of automatic blueprint library sharing in multiplayer is removed. The "shared blueprints" panel is removed. Blueprints and blueprint books in multiplayer will be shared by manually trading the items or by linking them in the chat. Blueprints or books linked in the chat can be clicked to pick up a copy that can be used as a normal item. The Blueprint creation dialog will add a checkbox labeled shared. It will default to selected to encourage the sharing of even work in progress prints. Upon joining a multiplayer game the Library is iterated through and all prints marked shared are available in an expanded (through scrolling) version of the previously described dialogs with a separator with each player's name above their contributions to the collective library. Or rather than grouping by player, the items (in advanced view) could be integrated to be sorted by icon/title with the player name becoming a final column at the right. Every Blueprinting Tool will have a unique identifier, so every blueprint item is unique, even if it has the same contents. ReassignAlter: assign new contents to this blueprint. This is helpful when you want to update a blueprint and leave it in the same place in the player inventory, blueprint library or action bar. Duplicate: create a new blueprint with a different unique identifier, but the same contents, and place it in the player cursor. This can be useful when players want to take a copy of a blueprint from the library to edit, experiment with or remove buildings from, without changing the original blueprint. Right clicking a shortcut to a Blueprinting Tool will open the blueprint editing interface, as if it was right clicked in its original location. If a Blueprinting Tool is moved between the library and the player inventory, the shortcut in the action bar remains valid and unchanged. If the Blueprinting Tool is moved outside any of these inventories (e.g., placed in a chest, or given to another player), the shortcut will become greyed out and cannot be interacted with, only cleared. If the Blueprinting Tool is placed back in the player inventory or blueprint library or reloaded from the save/restore feature, the shortcut becomes valid again. If the Blueprinting Tool is removed (or destroyed) from the library, and a different game is loaded that had a shortcut to that Blueprinting Tool, the shortcut will become greyed out forever, and it can only be cleared or restored from disc if previously saved. This is to give feedback that there used to be a Blueprinting Tool there. If a Blueprinting Tool is explicitly destroyed using the trash button, the shortcut will become greyed out forever and it can only be cleared or restored from disc if previously saved. This is to keep consistency with the two rules above. Blueprint books will have the same sparse grid where you can arrange the contents as you like. 'Shift + Mouse Wheel' will move to the next/previous non-empty slot. This order would also be able to be set through the list view via drag/drop if desired or if one of the sorting modes have been last selected, it will automatically add new items in that order. Blueprint books will not have any special behavior or interactions while in the library, right clicking them will open the book in a separate window, possibly closing the Library. Clicking them will pick them up to the cursor. Blueprinting Tools are created using buttons in the Library. Blueprint string importing will also be there. Quick Copy pasting will be done using new copy-paste functions that work almost identically to blueprints. Pressing 'Ctrl + C' will place a copy tool, similar to a blueprint in the cursor. You can use this select a number of entities to copy. Pressing 'Ctrl + V' will place a quick paste tool in the cursor, similar to a blueprint with items. You can use this to place as many copies of the things you copied as you like. Additionally, Pressing 'Ctrl + X' will mark entities for deconstruction but also place a copy into the 'clipboard'. (An option to include tiles should be added to the game options. Perhaps a dropdown "Cut tiles -> 'Never', 'Always', 'with Ctrl + Shift + X'. The quick copy and quick paste tools are not items. Pressing Q will simply clear the cursor and not return anything to the inventory. Being able to use all the fast transfer shortcuts in the blueprint library makes it very consistent with a chest, but can lead to very nasty situations where one accidental click can transfer all the blueprints and books to your inventory, completely screwing the order and organization you had in the grid. At the same time "transfer everything" can be something some players might use often if they don't have many books. The 'hidden order' property could be written out with the items even in a chest. When another "transfer everything" event occurs back into the player's inventory, the entire list of 'hidden order' is reconstructed from the items in the bulk transfer and added as new rows under the player's current set of items in their Library, partially preserving the spatial sort. Picking the items one by one would of course add them to the end of the Library in the order selected. The blueprint editor GUI should allow you to zoom and pan around to better inspect it. You can add buildings while holding an item or ghost item from the action bar; for convenience a small interface will give you the possibility to place any ghost item in the cursor. This is intended for quick corrections. Things like connecting cables or changing entity settings will not be possible; for bigger changes use the Reassign Alter button. The blueprint library button will be disabled until bots are researched or until any item is added to the library for the first time. This means less GUIs for new players to get lost in, also less of an invitation to use the controversial string importing at the beginning for the game. Clarification: pressing 'B' would show the simple dialog, but the further topic of gameplay dynamics is out of the scope of the interface discussion. Depending on gameplay design choice this dialog could (a) prompt the player to research a new blueprint research item, (b) prompt the player that blueprints are not available at all until bots are researched, or (c) be fully functional as the BP system is now, but initially empty with perhaps a tutorial link on bots for truly new players or as the jumping off point for an experienced player who has simply started a new play through and wishes to use BPs to plan while still placing by hand. Last edited by NIronwolf on Sat Jul 07, 2018 10:48 am, edited 5 times in total. ^these two posts above are awesome, and so is proposal 0 by itself. i only started playing in 0.16. Is there a reason for the apparent indifference regarding list-view proposals? PS: shared library was pretty cool, i'm not sure how i feel about its planned removal. Lastly In the latest Friday Facts that we wouldn't have access until we have researched robots, but one of the things I liked in 0.16 was access to pre-make complex Make everythings/Malls/Hardware stores/Whatever you want to call it, and then blueprint it into my next game pre-configured for everything i would need from early game to late game! One feature that I miss is to just put a blueprint book inside a blueprint book. Please add that too. Yes please to adding option for detailed tree view. No to removing shared blueprints. Kudos to the team for including us in the discussion! and kudos to the players for their passionate inspiration, creativity and participation! ReassignAlterUpdate: assign new contents to this blueprint. This is helpful when you want to update a blueprint and leave it in the same place in the player inventory, blueprint library or action bar. Besides that, this is pretty much a decent proposal with adequate functionality for a library useful in every stage of game experience. I think this addresses just about every concern I have. If blueprint functionality wants to be locked behind say a red science research, that would be fine. I really don't think it should be locked behind robots though as it's completely useful to use by hand. So of the options A or C for the blueprint library button are better than B.
I like the sharing idea on this post as most things in Factorio are shared by default so it does fall more in line with how Factorio works. A simple checkbox to stop sharing would be fine, and I'll add if a server admin wanted to stop player sharing, they should be able to disable sharing if that would cause issues on their server. For the tree view to work, I really do think a blueprint chest is just the best way to handle that. That way you can just mirror the functionality of the library to a chest. All in all though I really hope NIronwolf's changes are used as they are fantastic! TsBandit wrote: The ideal UI should somehow balance between the advantages of spatial organization (when the number of blueprints is not large) and the advantages of hierarchical organization (when the number of blueprints is large). I don't think, that a single view with the advantages of both views is possible. It would surely be more complicated than any of the two and therefore not well-suited for the average player. But Wube will probably provide the tree view as an additional option in the future (they might also decide to make views modable with the new GUI toolkit, so they do not have to implement it themselves - *hint* *hint* Wube ). The grid is better suited for small to medium amounts of items and therefore the view to implement first. I think that EVERYTHING should be a blueprint - you don't build anything, you place a blueprint, then, if you are near enough it gets placed automatically from your inventory. Or somesuch. That would allow so much more flexibility with toolbar and whatnot and would solve issues of not having construction bots in early game. Not perfect (but that would be impossible anyways), but proposal zero seems ok and definitely better than the other 4. I am still not quite sold on the action bar idea, having just 10 minutes ago gone searching for some heat pipes that didn't have room to drop into the toolbar after crafting. I guess searching for the reactor bar (with the heat pipes in a known location) would probably be a little quicker. But mods could still scramble things with new items. Definitely this! This fixes almost all problems I have with the proposal 0. NIronwolf wrote: The Blueprint creation dialog will add a checkbox labeled shared. It will default to selected to encourage the sharing of even work in progress prints. Upon joining a multiplayer game the Library is iterated through and all prints marked shared are available in an expanded (through scrolling) version of the previously described dialogs with a separator with each player's name above their contributions to the collective library. Or rather than grouping by player, the items (in advanced view) could be integrated to be sorted by icon/title with the player name becoming a final column at the right. And let it be clear: I totally support keeping the option to share blueprints. Browsing other player's blueprints libraries is a necessary condition for any sharing, beside some rare special cases. Actually, is there any reason to remove sharing? It isn't mentioned in the FFF. I don't agree that blueprints should be shared by default. I have a lot of experimental or half finished or just poorly designed blueprints that are not very useful even to me. Flooding the shared space with them wouldn't help anyone. I'm also in favor of keeping default sorting by players because I just don't believe that categorization systems of different people will be compatible at all. I don't know what to think about the reassign option because its function isn't described. Is that mean that the blueprint will act like an empty blueprint but it will keep title, icons and link to the library. This would definitely be helpful. It would allow to easily replace an old design with a new one. It is insane how often I have to enter the same title when I'm working on an experimental design and I'm updating the blueprint. If this is the function of this button, I agree that "reassign" isn't the best name. I'm concerned about persistence of blueprints in the library. There are two actions that should require an explicit confirmation from the player: removing blueprint from the library and updating it. The confirmation for removing is rather obvious so I will focus on updating. Players, who often use blueprints, will be forced to make backups because they cannot rely that the originals won't be destroyed by accident. <NO_NAME> wrote: I don't know what to think about the reassign option because its function isn't described. So... could we have more information on the Reassign function? Or is it still a WIP? Sounds like it could be anything from a full-blown blueprint editor to a simple "pick an item and then you can add that one item to the blueprint for later editing in the other mode". I'd of course prefer the former. I really hope that you don't make blueprints and bluprint library unusable before researching bots. They are very helpfull even before bots just as guidlines for manuala building. I am sure you all have seen this reddit thread, but I think this is exactly how they should act. I think that blueprints being items is unessisary, and only adds more complication and confusion then keeping them as items for "consistency". There is very little about blueprints that say items, so why force them to stay as one? TuckJohn wrote: I think that blueprints being items is unessisary, and only adds more complication and confusion then keeping them as items for "consistency". There is very little about blueprints that say items, so why force them to stay as one? Blueprints as items are in some people's play styles, particularly multi-player. For instance leaving blueprints at outposts for consistency. They are also used by some mods as part of their core functionality. These are corner cases, but should be maintained for those players. A possible solution would be be to split the concept and reintroduce "Hardcopy Blueprints" as a recipe needing a green chip to store it on like before. And maybe a book needing a red chip. Then all the new "Virtual Blueprints" are stored in the Library with the storyline of what's in your Library at the start of a play through was what could be recovered from your crash. Allowing them to be used by that specific player. First of all, yet another great addition to come. At least as a concept. It definitely needs some thinking. A lot of good ideas already have been given by the community. But especially two are very concerning to me! Imagine the start of a new game. You usually want to plan ahead for efficiency reasons. I have a blueprint 2 tiles wide and 60 tiles long. It's the very start of my main bus. One of the two tiles is occupied with conveyors and power poles while the other has combinators showing the item that eventually goes on the belt. NOT having this would mean i have to have a screenshot where I have to tab out of the game and rebuild this every time I start a map from the screen shot. Why would I want to invent the wheel every time I start a game? Isn't that more cumbersome than simply being able to place the blueprint? Making the game experience smooth and streamlined? Not convinced? Other example: There are a few achievements counting on you to be quick about things. What we see on streams, Youtube (TM) or similar services are mostly the (semi) professionals showing off with there efficiency and speed (because - be honest - slow or inefficient content nobody would want to watch). For the new or average player (those that potentially buy the game because all the professionals do have the game already) a good and valid way to keep up and succeed in certain speed based achievements is placing blueprints at the beginning of the game as a guide line and sticking to it. And here my strongest reason: Blueprints are some kind of personal progression and achievement. Once you managed to order (all or parts of) your builds the way you would like them best you take a picture for future use and reference, right? This is why we have blueprints. But you want to use those blueprints. They are your personal creativity. That part of the game no guide, no video and no internal game mechanics tell you how to design your creations. Sure if people need to be Jerks and copy huge libraries from somewhere and just plonk them down it's their fault. But just to have those people not do this any more is also not a reason why everyone else should not be able to re-use their creativity from the very beginning of the game. Can you please not say that word again? It sounds so forever-ish. If I put my Uranium refinement blueprint in a chest next to my precisely timed and tweaked Uranium refinement plants (for later use) and biters eat the chest together with all my uranium refinement plants, I can redo the whole blueprint again? From scratch? Gecko wrote: For me there is a very strong 'HELL, NO!'. TuckJohn wrote: I am sure you all have seen this reddit thread, but I think this is exactly how they should act. I think that blueprints being items is unessisary, and only adds more complication and confusion then keeping them as items for "consistency". There is very little about blueprints that say items, so why force them to stay as one? I really like how that works. Keeps blueprints organized and allows for descriptive names that immediately and unambiguously identify the blueprint, without needing to mouse over or anything of that nature. i can't agree with this. one of advantages of blueprint library was that i didn't need to manually count starting smelter area and other stuff, i have starter area BPs in my library, i could lay them down, so i will have clear layout, how i will build. building from scratch (and redoing, when you put something one lane off and so on) is tedious, having library, which i can use to ghost print, and later manually place my stuff into ghosted entities was one of advantages, when blueprints were no longer locked behind robot research.